North Stonington Historical Society, Inc. The Society was founded in 1970 to perpetuate the history of the Town, to encourage the study of the history of the town and to preserve manuscript material and relics relating to that History. 1 860 535-9448. The Society Collection is available for use in the library. There is parking on the premises. There is no admission charge although donations are greatly appreciated. 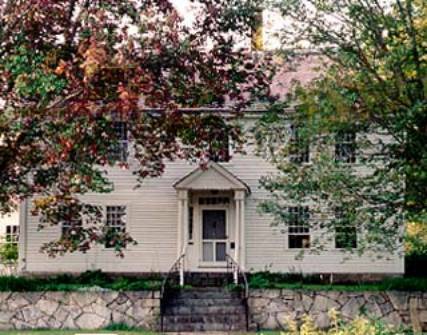 The Society maintains the Stephen Main Homestead (1781) as its Headquarters. This is also the home of the A. Morgan Stewart Memorial Library. marriage data for family members is important. General knowledge of your research area is helpful. Settlement of this area had begun by the 1660's and was aided by land grants public service. In 1720, the north religious society of Stonington was formed to erect a meetinghouse convenient for local worship. It was named North Stonington in 1724 and incorporated as a town by the General assembly in 1807. During the 1700's, agriculture was the principal business, together with fulling mills, grist mills, and sawmills. The increasing population in the early 1800's and habits of industry amd economy brought tanneries, iron works, cabinetmaking shops, dye houses, dry goods and grocery stores, and cottage weaving. the town became a prosperous and renowned mercantile center during this period. Changing times left dairy farming the principal industry by the turn of the century. Gradually thereafter, the town took on the residential character seen today. North Stonington includes the settlements of Clarks Falls, Laurel Glen, Pendleton Hill, Ashwillet, and the village of North Stonington, formally known by the descriptive name Milltown. Join us at the Stephen Main House on Sunday, February 10, at 4 pm or 6:30 pm for our annual musical Valentine. Tenor Ian O’Brien will join Parlor Concert Series Artistic Director Aymeric Dupré la Tour to perform Biondina, a song cycle by Charles-François Gounod, to celebrate the bi-centennial of his birth. The concert will also feature vocal and solo piano works by Carl Czerny, Franz Liszt, his first American student, William Mason, and others.